I have always been fascinated by apes, and to a lesser extent monkeys; both for themselves and for what they can teach us about ourselves. I did several grade-school projects on hominid evolution, and my senior term paper in high school was on interspecies law; this was not an animal rights-type thing, but rather an examination of the characteristics we might use to define a “person” for the purpose of assigning legal rights. The “fetal personhood” crowd (which, thankfully, didn’t exist in 1983) insists that a blob of cells carrying the human genetic code be considered a “person” for legal purposes…so why not a full-grown chimp, which shares 98.5% of those genes and is far more intelligent than a human infant, much less a fetus? Others want even the mindless, abandoned chrysalis of a human which cannot survive without machines to be treated as a “person”…so why not gorillas who can communicate using sign language? In the next few centuries we may come into contact with extraterrestrial intelligences who are completely different from us biologically, or even be able to build machines which can pass tests for sentience; when we redefine our laws on what constitutes “personhood” to allow for that, where will our closest relatives fall? Though we’ve been studying apes for decades, these findings and incidents are all comparatively recent, so what’s going on? Are the apes actually getting more intelligent, due either to evolutionary pressure exerted by human encroachment, direct learning from their human observers or the more consistent nutrition in primate centers and the like? Or were they always this smart, and they’ve just recently become comfortable enough around humans to demonstrate it? There’s one more alternative: maybe they always had these capabilities, but scientists simply refused to acknowledge them for much the same reason some still stubbornly insist that apes who use sign language aren’t “really” communicating. We’ve believed for a very long time that there is a sharp line between humans and other animals, and a lot of people are made extremely uncomfortable by the idea that there might not be; that’s why they pretend there’s no such thing as evolution, or at least that only our bodies are subject to it while our behavior is somehow magically free from any evolutionary influence even though no other animal’s is. In other words, it may be that early primate researchers unconsciously disregarded overtly humanlike behaviors, just as prohibitionist “prostitution researchers” disregard any findings which tend to disprove their deeply-held beliefs. If this is true, the reason all these things seem to be happening at once is that the observations have finally reached the “critical mass” beyond which it is impossible to ignore them any longer, and each new report emboldens other researchers to release the similar findings they were hesitant to mention before for fear of ridicule. And I won’t be at all surprised if, sometime in the next few years, a scientific consensus arises that our cousins are a lot more human than we had previously believed. I wonder if there is a Flynn Effect going on. Human IQs have risen over the last century. Not because we’re getting smarter, per se, but because our society — with its ipads and computers — demands more abstract thinking and allows us to reach more of our massive mental potential at ever younger ages. I wonder if exposure to humans and abstract concepts like language is causing a Flynn effect in primates, where they are reaching more and more of their intellectual potential. Have human IQs really risen in the last century? I doubt it; rather, it’s more to do with how and what we measure that’s changed. Our society has changed, what was common knowledge a century ago is forgotten or unknown now, as it was a century or two beforehand. A few generations isn’t long enough to effect a significant change in IQ. Look to the ancient Greeks; now, they were really clever, intelligent and questioning people. Euclid’s geometry is still as relevant today as it was 2 millenia ago — albeit we realise now that it is limited to flat surfaces; other surfaces were Victorian ideas. Look at the astronomical clocks in Prague or Bern; today, we can’t read them easily, even with the help of the guide book; in their time they, most people knew what they signified. Are we more stupid? No, our knowledge differs from those people; but we are neither more or less stupid. It’s just what we know that differs. Yes, IQs have risen, but humans haven’t gotten smarter. The Flynn effect isn’t g-loaded. And actually, there is some evidence that humans have gotten less smart. Reaction times are correlated with intelligence, and people in the last 1800s had better reaction times. Couple this evidence with the fact that smarter people have less children, yeah. Idiocracy, here we go. And to the person below, No, Euclid is not as relevant today since reality isn’t euclidean. How do we know that people in the 1800s had faster reaction times? Even if true, how would we know. The classic ‘drop a yardstick’ test comes to mind. Actually, now that I think on it, bullet hells rarely involve fast reactions, but rather, controlled reactions. Hmm. Maggie – please don’t give Paul Watson any more ideas for his animal-rights reality shows! I would love to read your senior term paper on interspecies law, Maggie! It must be breaking ground, then and now! What might set the human animal species apart from all other animals is its innate talent for beliefs that has apparently been stronger developed than its talent for objective reasoning for most of its history. The talent to have assign a mighty God to everything scary because we can’t explain it. If the future results of primates’ research will get too threatening to the belief in human supremacy over the rest of nature, creationist researchers will find irrefutable proof that the primates are degenerate descendants of Cain, the first human being to kill its own kind, a capital sinner if there ever was one. Doesn’t this explain why we still share 98.5% of the genes. Reasoning is prompted by by hypothesis which springs from imagination and fantasy. There cannot be belief without fantasy and imagination. Not reasoning but imagination seems the fuel that propels human life. For instance I believe that fantasy, not reasoning, is one of the most reliable allies to secure whoredom its business. I’m just curious … atheists DO realize that many people (such as myself) believe in a “creator” and also in evolution – don’t they? I’m just asking because I see a lot of attacks on religious people who are supposedly “closed minded” and don’t accept science – as if religion and science are incompatible with another (they are perfectly compatible). There’s plenty of us out here who accept science. I actually do believe that science and religion are incompatible as systems of thought. Science is based on evidence and religion on faith. Why do people who normally follow the evidence decide to go on faith in the one special case of their particular religion? By what criteria am I to decide when I should abandon evidence in favor of faith? So, what’s the scientific basis for religious belief? Science hasn’t answered all the questions yet. They haven’t answered yet how everything came from nothing. And … even if everything DID come from nothing – the natural laws that governed it’s creation had to come from somewhere. Who created those laws? Until those ultimate questions are answered (and frankly – they never will be) then science will never be able to “disprove” the existence of a creator. And – it’s not the job of science to “disprove” the existence of a creator – in fact, thinking of it that way is somewhat “unscientific”. The job of science is to discover if the universe had a creator – not to disprove the existence of one but to also PROVE the creator’s existence – if indeed he does exist. However – Science may never be able to prove this decisively. It can’t now – that’s for sure. So to answer your question – the “scientific basis” for a belief in a creator stems from the fact that science hasn’t answered the question yet. Once it does – then people will forced to realign their belief systems with either science or religion – and at that point they’ll be either be in complete harmony or in direct opposition. Whereas – I know a lot of atheists who are chomping at the bit – they’re impatient and want science to disprove the whole “God Thingie”. That’s not really a scientific outlook is it now? No science hasn’t answered all the questions yet. Did somebody say it did? Is this evidence for existence of a creator? Uhmmm… well science also hasn’t disproven the existence of the flying spaghetti monster. Is this the “scientific basis” for a belief in the flying spaghetti monster? So you believe in that as well since it hasn’t been disproven? I don’t expect science to disprove the whole “God Thingie.” There is no need. When one makes a claim, one assumes the burden of proof. If I claim X, the burden is on me to prove X. I cannot just assume X is true until you disprove it. Kurlac – do you admit that your belief in the creator is based on not much more than faith or do you expect us to take your argument above as evidence for existence of a creator? LOL – is it evidence that there is NOT? Wouldn’t that be a case where religion and some scientists are in harmony? I mean, if you’re suggesting everything arose on it’s own – that’s not markedly different from a creator arising “on his own” now is it? I’m not trying to convince you of anything. Let’s remember here – that I started out this conversation by saying that, as one who is a believer, I believe that science and religion are harmonious for many who believe in a creator. My view, was then challenged with the saying … “What’s the scientific basis for God?” Which really has nothing to do with what I said in the first place. What’s the scientific basis behind my love for a telecaster guitar? There is none – it’s art – it’s expression – it’s feeling. First – I’m not trying to convince anyone – I’ve repeatedly stated that I myself am looking for the truth. My “belief” in a creator is based on logic though – that there is one hell of a lot of mass in this universe and it had to happen somehow. Science hasn’t really adequately answered this and, admittedly – neither has religion. However, and maybe this is just me – I’ve seen a lot of bad things in my life but I have lived one hell of a life and I am constantly amazed at its depth and beauty. Just before typing this I walked outside my tent to view the arctic landscape – because that’s where I am right now. You would not believe it. People wouldn’t do drugs if they could see these kinds of views and view the beauty of this universe the way that I can see it. Disproving something that produces no testable hypotheses is outside the scope of science. Regardless, the statistical likelihood of the whole “God Thingie” is very low, and people should feel free to dismiss it at their leisure. You have calculated the statistical likelihood of the existence of God? Really? For me, the notion that there exists an all knowing, all powerful entity that created us all from nothing strikes me as improbable. Similarly, the notion that the universe that we know, including Macbeth, Beethoven’s Ninth, and the ceiling of the Sistine Chapel, just sort of happened by the accidental workings of natural forces also strikes me as improbable. Anyone who knows for sure how this all came to be is obviously much smarter than I. If I said I calculated it, then I must have. In this case, the inverse also applies. There are marvelous things in the world, and we want to know who to praise, thank or otherwise blame for our fortune. I cannot deny this. As much as the God of the Gaps is an fun argument in theological discussions, I will continue to say god is statistically unlikely*. This does not say anything about what I know or don’t know; it implies that I’m unwilling to spend time maintaining imaginary friends based on ignorance. I have made my choice, and other people should be free to make theirs as they see fit, without demonization, persecution or stigmatization. *: The God Delusion by Richard Dawkins provides what I interpreted as a sound argument on this topic. Yeah see – this is very much my view of things when it comes to “religion” – which really is a misnomer for me since I don’t follow any religion. Was there a God? is there still a God? Does he give a damn? I don’t know with 100 accuracy the answers to these questions. Logic leads me to believe that everything had come from somewhere – and not only that, but it certainly is VERY WELL put together. So the only explanation I have is that some intelligent force planned and built it. But – how can I know that? I can’t. That’s where science is supposed to help me with those answers. i believe science has proven the theory of evolution. Many religious people were convinced by the theory evolution – not to give up religion, but to adopt evolution as the explanation for how we arose on this planet. Many also logically concluded that a creator could have used evolution as the means to create us. Having a creator doesn’t mean he has to do everything using “magic” which can’t be explained scientifically. In some senses, I see us as energetic friction. If the purpose of the universe is energy exchange, then we (and all of life) are glomming onto available energy and slowing down the exchange. Plants store and convert the energy, and we consume the plants, and these processes take time. Without life, energy from the sun would just dissipate into space. I can emotionally get behind Sol & Luna as regional (i.e. solar system) deities, but beyond that? I am generally at a loss, despite wanting to know why atoms hold themselves together, and why do masses have attractive forces? –> “I am ignorant, therefore God exists”. This is not a valid argument! If one assumes that everything has to have a creator, one must answer the question of what created God. And then what created whatever created God…. If one dumps that wholly unwarranted assumption, there is no need to answer silly questions like, “Who created reality” or “Who created the rules of reality”. Fact is, they are and that’s all that needs saying. Anyway, I strongly recommend reading George Smith’s “Atheism: The Case Against God”. Classy. Still, you shoot holes in those who don’t have a 100 percent answer when your own religion of science hasn’t answered the questions either. Look at the rest of your post above and apply the same kind of scrutiny to science. If one assumes that everything has to have a creator, one must answer the question of what created God. And then what created whatever created God…. I don’t have the answer for that – but then again, you can’t answer how all this stuff got created. You can’t explain the magnitude – or how well the laws fit together in this universe. It would appear that neither of us KNOWS for sure anything about anything. Yet you conclude that I am ignorant? It’s a good conclusion – because I am ignorant. The problem is you don’t see the mirror that indicates the same of you. ^^That’s an acceptable answer to you? That’s kind of funny — you do see the level of hypocrisy in that don’t you? The onus of proof is upon the one who asserts the positive. The rationale for that is that nothing follows upon non-existence. A real world example of this is the legal maxim in the US, (today more honored in the breach) that one is innocent until proven guilty. For instance I could assert that a conclave of invisible green gremlins on Mars is the source of all physical creation. And then tell you that since you can’t disprove it that my thesis is thereby established. One tactic that was used in the various Inquisitions was just this sort of assertion. A knowledge claim made without supporting evidence is an arbitrary assertion and is so far removed from epistemological processes that it isn’t even right or wrong. Omniscience is not a valid standard. To argue that since one doesn’t know everything then one knows nothing is to expect that human cognition must conform to an arbitrary standard that was imagined by dogmatists and bestowed upon their fantastic creation of an omnipotent deity. The Greek Pantheon was far more realistic than that. Your argumentation has degenerated to personal attack. I think it’s time to take a breather and, perhaps, have this debate at some other time. I have lived with cats and dogs. They have their own intelligence, different from ours, but certainly there. We are so stuck on our own intelligence we cannot recognize the intelligence of others. I have 2 dogs. This happens all the time: Dog B is sitting in the chair that Dog A wants to sit in. Dog A starts barking at the door, causing Dog B to come running to see what is going on, allowing Dog A to go sit on the now-empty chair. Dead right. Things that require human intelligence are always rated far above things that require animal intelligence. Also, the way we design experiments to test animal intelligence tend to really test how close to human intelligence they are. Goldfish were discovered to have a memory of more than two seconds a while ago. Maybe we stuck to the 2 seconds idea because that’s about how long a fish takes to swim around a small bowl, and if they’d had any longer memory keeping them like that would be cruel (as it was/is): but mostly I think it’s because we did not have the wit to design an experiment that could test fish intelligence. I saw a documentary which showed apes playing the memory game on a computer. Their performance was absolutely staggering. They aced it every time, with perfect recall. It blew my puny human mind. Vercors covered this topic as well, in ‘You Shall Know Them’, where he explored the idea that there wasn’t (at the time; and maybe still isn’t) a legal definition of a human being. Adapted into a neglected movie ‘Skullduggery’. Better that than they decide we’re really tasty and nutricious. The general speculation in much bad SF is that the aliens have better technology, but otherwise behave exactly like human beings. Given our history as to what happened when high-tech cultures encountered low-tech cultures, we may be much better off being alone in the universe. Aliens have not yet wiped us out. Since wiping us out would be ridiculously easy for any alien race able to reach us,* it it is reasonable to conclude that either the aliens do not exist or that they are not hostile. They may or may not be watching, they may think we are horrible but too insignificant to be a threat (meaning they could become hostile in the future), they may be waiting for us to cross some threshold before they welcome us with open tentacles into the Galactic Brotherhood. Again, they may not exist at all. At this point we simply do not know. But, if they exist, they are not out to get us at this time, or we’d already be dead. * That stuff where the aliens send a dozen flying saucers to hover over our cities for three days and then engage the Air Force in dogfights is the Bull of Onie. They could simply drop asteroids on us. Our first clue that anything was wrong would be when a rock the size of Mt. Everest was spotted heading towards Earth at 50,000 MPH (80,467 KmPH)… followed by 200 more of the same size and speed. We are not currently capable of stopping ONE of these rocks, let alone 201 of them. Or a thousand. They could build huge mirrors beyond the Moon, reflect sunlight at us, and subject us to some serious global warming, raising the entire planet to pottery kiln temperatures. If space-faring aliens decide they don’t like us, we’re toast, that simple. But a delicious, meaty, high protein toast, n’cest ce pas? That’s got to count for something. Just a quibble: The mere fact that an alien race could reach us wouldn’t entail the ability to wipe us out. E.g., the alien race might only be able to send a single ship, with no more than the capacity to get here. However, an alien race that could stage an invasion of Earth with any chance of success should also be able to finish off the human race without invading. The premise of Uchuu Senken Yamato (translated into English as Star Blazers) is that in the near future, Humanity has moved into space and is exploring the Solar System. We have ships all over the place, but have not yet managed to go interstellar. And then the aliens invade. The nations of Earth unite as one, and remember, we’re a bit space-faring ourselves. It doesn’t matter; the aliens kick our collective arse, hard, and within a year, all life on Earth will be extinct. Only two things give us any chance at all: the aliens are but a remnant of their civilization, so we aren’t facing their full strength, and another alien civilization is willing to give us a hand, a little bit, if we can do something amazing ourselves. It was the first animated TV show I watched that I knew was from Japan. I didn’t know that Speed Racer and Battle of the Planets were Japanese, but I knew that Star Blazers was. Heh. This brings back a recollection of the days when dinosaurs roamed the earth. 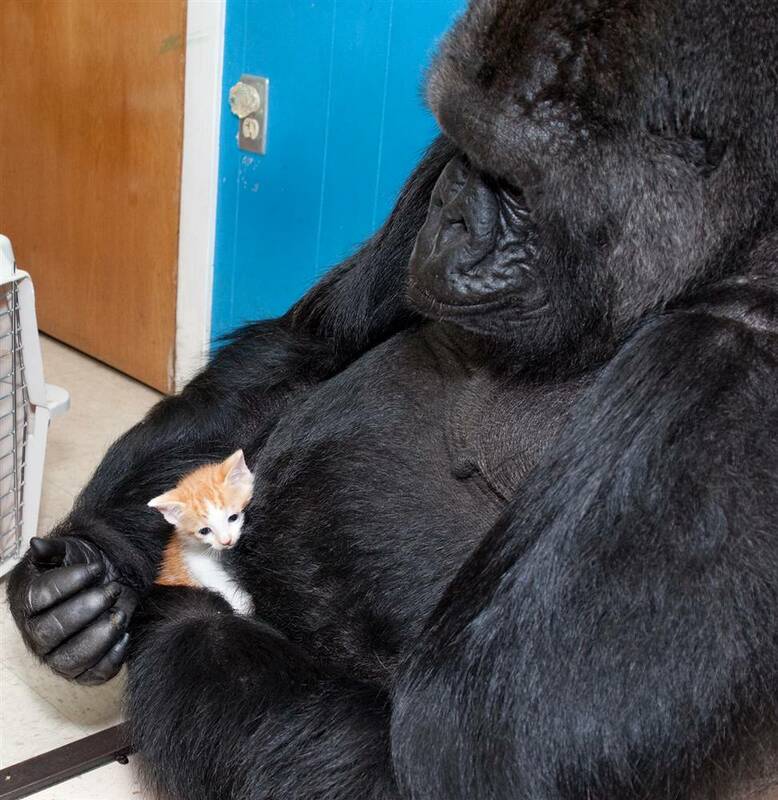 A friend and colleague, now deceased, was a neighbor and friend of Francine “Penny” Patterson, Koko‘s keeper. He was also an engineer. He told me that Patterson wanted to find an alternate way for Koko to express her sign language, like a keyboard and computer display. I think this was mostly so humans wouldn’t have to learn to read gorilla hand signs. Koko couldn’t use a regular human QWERTY keyboard because, well she had big fingers and was kind of rough on them. So, he got an industrial keyboard with fist sized (and fewer) keys like are used in factory floor environments to control heavy machinery. Made an interface to connect it to an early PC. I think they painted signs on the big keys. Koko could then pound away on the keyboard to display her signs strung together on a monitor like sentences in any language. Humans could read the signs (maybe converted to human text words by the computer) like reading any other language. What I want to see is a gorilla blogging gorilla sign language on the intertubes. 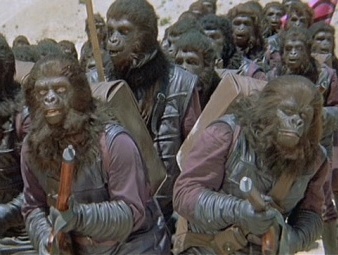 The people who are teaching apes sign language clearly haven’t seen “Planet of the Apes”, which shows the clear consequences of teaching apes to become more like us. That movie is a cautionary tale, like all good science fiction. But people don’t LISTEN. Ayn Rand is frequently ridiculed for her statement that man is the rational animal. People say, for example, Oh come on! People are rarely rational! Or, animals have intelligence too, so how can you say people are special? However, Rand did not mean by that that people behave rationally or that people can reason or even that there is anything special about human intelligence. All she meant is that the human peculiarity is that reasoning is intimately tied to human life. That does not entail that people will reason or that other animals don’t have the ability to reason. Ignoring the evidence related to primate intelligence for the moment, it is logically possible that non-human primates are fully capable of human intelligence–but don’t display it in the wild because it isn’t relevant to the lives they lead there. So, it could be that, once non-human primates are put into a human environemnt, they display human intelligence. The evidence doesn’t go that far; no matter how integrated a non-human primate is into a human environment, it never shows anything like the adult human capacity to reason. But that certainly doesn’t mean that the other primates don’t have capacities for intelligence that they never or almost never display in the wild. In fact, it would be really odd if they didn’t. Humans evolved from other primates and did so over an evolutionarily relatively short period, so the uniquely human abilities should be few in number. Non-human primates very likely had most of the mental machinery that humans do, even if they didn’t use that machinery or used it differently than humans do. On this view, the transition from child to adult human happens because the wiring matures in some sense. Non-human primates would either not have this wiring or would have it in some primitive state. They could have the mental potential of human children at a certain point in development. They could display that potential when put into a human environment. However, they would not be able to have adult human intelligence, and they would not likely display their full potential in the wild. You’re not the only one to have thought of the Mangani. I first read of Bili apes on an Edgar Rice Burroughs on a Yahoo! group. Here’s something to think about: western science learned of chimpanzees in the Fifteenth or Sixteenth Century, but only learned of bonobos in the Twentieth. A lot of things written about the evolution of human behavior are based in studies of chimpanzees. Now imagine an alternate history in which western science learns of the bonobo in 1650 or so, and doesn’t know about chimpanzees until the 1940s or so. How would our theories and hypothesiseseses (I don’t know the proper pluralization of that word) be different? Every time I’m tempted to think of humans as being substantially more intelligent than apes, I come across events like the political conventions currently underway. People are rewarded with control over nuclear weapons for standing in front of a crowd and yelling, “I’M PART OF YOUR TRIBE!!! I LOVE THE THINGS YOU LOVE AND HATE THE THINGS YOU HATE!!! …And the crowd cheers and falls into line.